French President Emmanuel Macron speaks with Mamoudou Gassama at the presidential palace in Paris, on Monday. 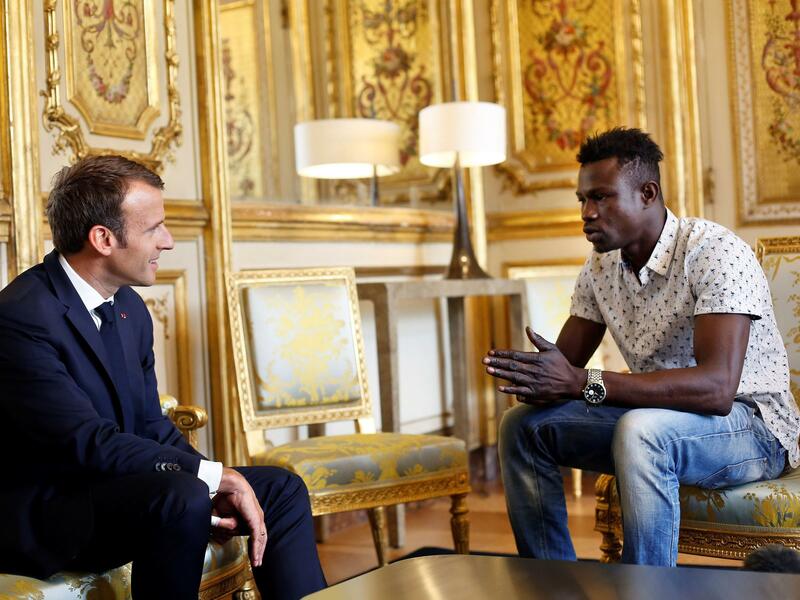 Macron offered Gassama citizenship for his "heroic act" in saving a four-year-old. The dramatic episode, captured on video, quickly went viral. And it turned Gassama into a national hero in France, where he was living illegally. "Congratulations to Mamoudou Gassama for his act of bravery that saved the life of a child last night," Paris Mayor Anne Hidalgo tweeted on Sunday. "He explained to me that he arrived from Mali a few months ago while dreaming of building his life here. I replied that his heroic gesture is an example for all citizens and that the City of Paris will obviously be keen to support him in his efforts to settle in France." On Monday, French President Emmanuel Macron invited Gassama to the presidential palace for a meeting. "I ran. I crossed the street to save him," he told Macron, the AP reports. "When I started to climb, it gave me courage to keep climbing." God "helped me," he said. "Thank God I saved him." "Bravo," said Macron, nodding with awe. For his "heroic act," Macron said Gassama would be rewarded with papers to allow him to stay in France legally, French citizenship if he wants it — and that the Paris firefighters brigade would welcome him with a job. "France is a will, and Mr. GASSAMA has demonstrated with commitment that he had it!" Macron tweeted after the meeting. The AP reports that Gassama had arrived in Europe after crossing the Mediterranean from Libya to Italy, where he has the papers to stay legally. But his older brother has lived in France for decades, and wants to join him there. French newspaper Le Monde reports that child's father is being charged by authorities for parental neglect.